I cannot believe it has been so long since I posted here. So much has gone on (all good thankfully) that I need to tell you about but Christmas will have to come first. The Costellos have been visiting some Christmas events around the North-West that I really must share with you while you still have the chance to go. 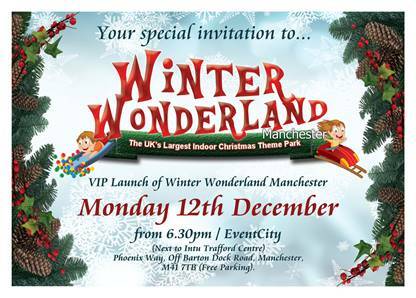 Last week, we attended the press evening for Winter Wonderland at Event City in Manchester (Right near the Trafford Centre). You may remember that we attended this 2 years ago and wrote about it here. There’s still time to visit Winter Wonderland in Manchester as it stays open until 1st January 2017 – Perfect for keeping the kiddies entertained during the remainder of the Christmas holidays. More information & tickets can be bought online at the Winter Wonderland website Tickets are £19.50 for children and adults, OAPs £14 and under threes FREE. Family tickets are available for £64. (booking fees apply). 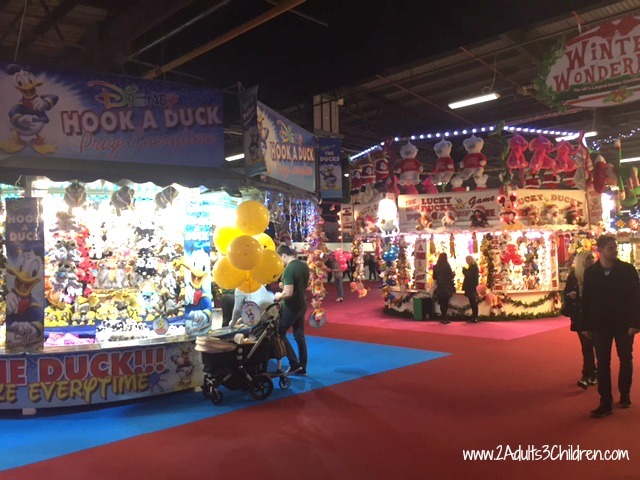 There are a few stalls towards the entrance that are not included in the ticket price so best to be prepared – We allowed Tara one go on the Hook a Duck stall for £3. Its her ultimate favourite fairground treat and she was delighted to come away with a soft toy minion. It is possible to walk past these stalls though and you are soon at the free rides which are great for kids of all ages. 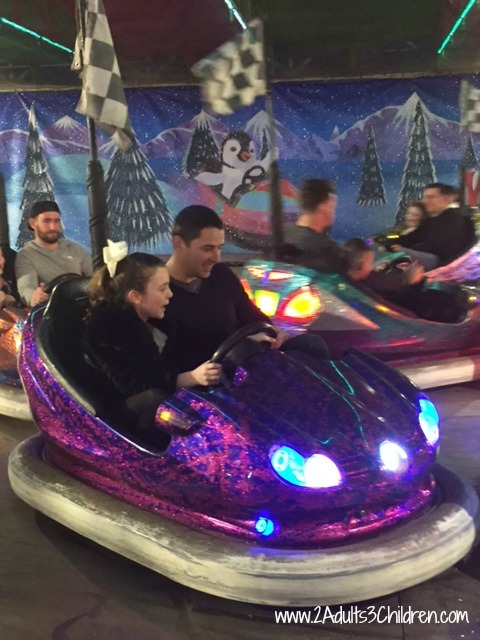 Our first port of call were the bumper cars – My idea of hell, but luckily Mr C was well up for them. Violet had a blast – turns out neither of them are very good at it though! About half way around the theme park, you find the circus tent with a large A frame outside. This tells you the times of all the attractions – We were just time for the arrival of Basil Brush so headed off to the seating area. Chance for a sit down for the grownups and the teen for the short show, then off we went to many rides. This is definitely the girls’ favourite part – No queues when we were there and so many to choose from. Even the teen enjoyed escorting her younger sisters on the faster rides. There are definitely more rides that are suitable for our younger children. I’m not sure whether 14 is about the limit for our eldest but who knows next year? 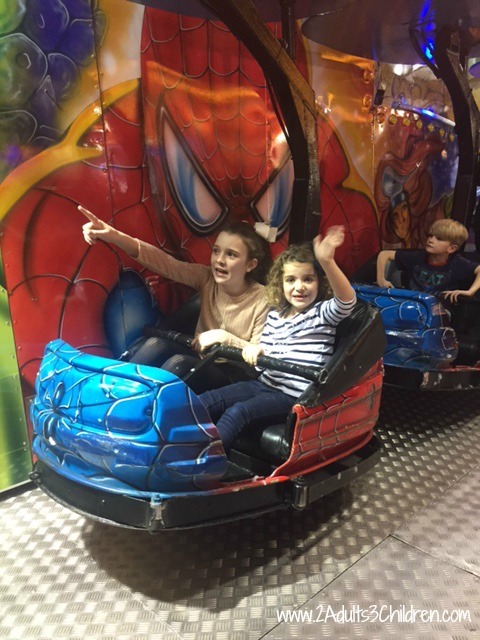 The circus was fast paced and lasted 30 minutes – Just the right amount of time for excited children who want to see what it is all about but equally want to get back on the rides. Our highlight was the unicycle and the girl juggler. What was really great to see was the young girl was dressed in casual girls clothes rather than skimpy outfits like some traditional circuses. There was the opportunity to pay to see Father Christmas but we didn’t go. Our girls were having far too much fun on the rides to be interrupted. Parking is free though in the substantial carpark right outside, which is a real bonus. Sessions are limited to 4 hourly intervals but really you will be so exhausted after that time, you will be ready to leave. Once again, a great day out to be had. If you can fit it in before Sun 1st January, then we highly recommend. It went back for so long – Enormous and so much to do! Amazing, it looks like you had one heck of a time. It was a brilliant way to spend a cold winter’s evening. Wow what a fun winter wonderland. 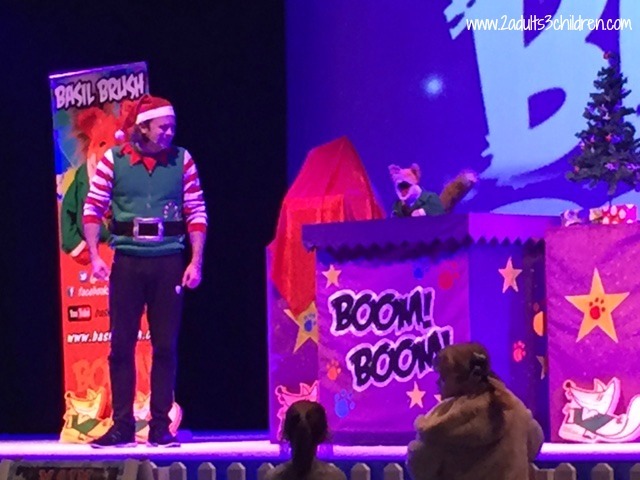 I bet Basil Brush was a fun experience! Was definitely a trip back to my childhood! Boom Boom! Highly recommended if you ever get chance – lovely and warm too! It looks like great fun there I didn’t get to go to the London one but might try next year if it’s like that. Oh what fun! I’m going to have to go one day – my kids would love it! aaah wow! I love how cosy and warm it looks! The one is London is FREEZING and you can’t do much with little kids when your insides are like a frozen bag of peas! Ooh I didn’t even know Manchester did this – it looks good. Looks like a great time! Unfortunately not close to us but looks great for people local to visit.